With the recent Black Mask news, you're likely either really excited...or wondering who the heck the guy is. If that's you, then read on! It's time to learn about this seriously underrated Gotham City baddie. If you spend long enough in Gotham City, you’re going to start hearing some names. Some of them are good: Batman, Robin, Jim Gordon…you know the drill. Others? Not so much. You’ll probably get your fair share of warnings about guys like the Joker, the Penguin, maybe even the Riddler. Those are all well and good, but I’m here to tell you that it’s time to forget all of ‘em and start thinking about one person and one person only: Roman Sionus, the Black Mask...AKA the REAL king of crime in Gotham. 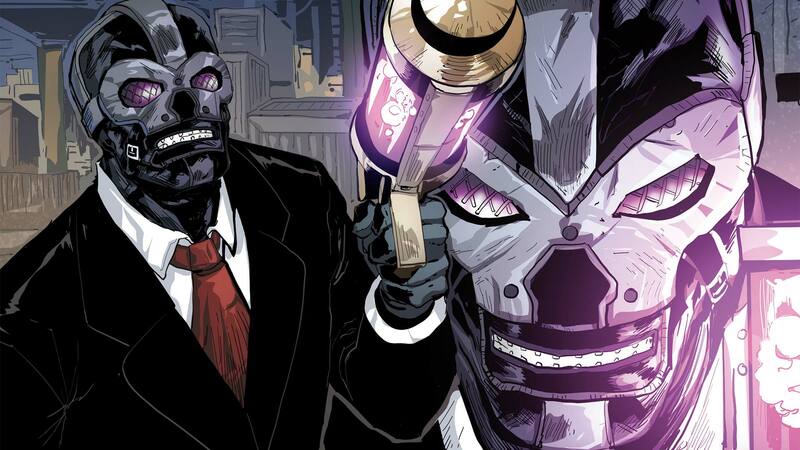 Let’s take a look back at some of the biggest highlights in Black Mask’s incredible (and incredibly successful) career. Some villains surround themselves with hired muscle, the kind of low level crooks who offer up their services to whoever they think can pay or protect them better than the guy next door. Totally amateur moves if you ask Black Mask. Hiring muscle is fine when you’re in a pinch, but if you want real loyalty, you’ve gotta start your very own cult. The False Facers were members of Black Mask’s “False Face Society,” which was the more or less official name for his gang back in the early days of his life in Gotham. Okay, sure, the name “False Face Society” may have been something he stole from the Joker, but it’s not like he was really using it anyway. Besides, what do clowns have to do with “false faces” anyway? It’s totally off theme. The False Face Society started as a pretty simple gang of petty crooks, but it didn’t take long for Black Mask push it to the next level. Every member of the society was given a mask that would reveal their “true” selves, and the whole practice eventually became a sort of religious experience, making the False Facers some of the most loyal and devoted scumbags around. Which was a pretty huge asset when the whole of Gotham City collapsed into the NO MAN’S LAND back in the early 90s. Black Mask and his False Facers were able to make a huge power grab during the whole ordeal. Their turf was situated mostly in the Garment District too, because that sort of theming is important if you want to be taken seriously in these parts. So, okay, sure, some of the False Facers went a little too far into the deep end and started disfiguring themselves under the name banner of the “True Facers”...and, fine, the whole of No Man’s Land collapsed eventually leaving Black Mask all but dead at the hands of Catwoman, but still… Not many people in Gotham’s upper criminal echelons get to boast that sort of success in their early years, so we’re going to count this one as a resounding win. Inspiring semi-delusional loyalty is only one item on Black Mask’s long list of enviable skills. He also happens to be a master business strategist and entrepreneur. You can see these skills really shining during yet another one of Gotham’s major catastrophes, the top-to-bottom, all out crime catastrophe known as WAR GAMES. Here’s the story: once upon a time, a vigilante and former Robin who called herself Spoiler made a pretty big miscalculation and inadvertently engineered the death or arrest of just about every crime boss this side of Metropolis. Sounds like a well-executed plan, right? See, nature, as they say, abhors a vacuum and that’s what Gotham’s underworld was suddenly facing. With just about every major player dead, there was a vacancy at the top of the food chain and it was something that Black Mask was more than willing to step into. Of course, that was easier said than done. Every two-bit crook who happened to have a connection or two was ready to make a power grab. The whole city descended into chaos almost overnight. It took a whole lot of work and no shortage of sneaking around for Black Mask to come out on top this time. He eventually came out of the blood bath with a crown and a throne, proving yet again that he’s the crime lord that Gotham deserves. Not even the Bat could bring him down this time. ...At least, not for a while. That part’s not important. The take away here is that Black Mask was the King of Crime for a good long while, and don’t you forget it. Okay, you know how the Joker and Batman have their whole rivalry-till-death thing? So, Black Mask has something like that going on, too. And despite being a pretty huge thorn in everyone’s side, it’s actually a status symbol, really, when you think about it. After all, what kind of super-villain doesn’t have an arch nemesis? That’s an important part of the package. So anyway, there’s this guy who calls himself the Red Hood, and he’s a pain. He showed up one day and just started...well, ruining everything. And not ruining things the way Batman ruins things but like, really ruining things. People died. It was bad. But more than that, it was frustrating. It was even kind of embarrassing. Honestly, half the time it felt like this Red Hood character was trying to be a hero and the other half it felt like he was trying to be Gotham City’s Next Top Crime Boss. The point is, it wasn’t a great time for Black Mask or anyone involved, really, and Red Hood is the sort of guy you really ought to avoid if you can as we learned in UNDER THE RED HOOD. But don’t you worry. This story never could’ve ended there. Black Mask wouldn’t be the man he is today if he let people just disrespect him like that. They were all but destined to have a rematch at some point, which they eventually did in RED HOOD AND THE OUTLAWS. Check out the first volume to see how it went. Yes, Black Mask may not have the name recognition of the Joker or Riddler, he may not have the brute strength of Bane or the brilliance of Mr. Freeze. But the guy knows how to get ahead in Gotham's ruthless underworld...and that's saying something considering the competition. Considering everyone he's gone toe-to-toe with over the years—Batgirl, Red Hood, Batman himself—one has to wonder how well a team like the Birds of Prey may fare. Feel free to share your thoughts on that down below, but a quick look at his comic book history is all it takes to make clear what happens to people who underestimate this frightening masked menace.